When I first started my fitness journey to a healthier me I was 285 lbs. 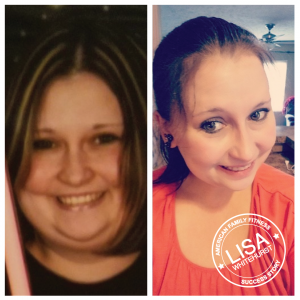 I told my husband I had to lose weight because it was taking a toll on me and I felt horrible. The very next day he signed me up for a gym membership. I started working out alone at first because I was too embarrassed to work out in a group. I had an amazing, inspiring instructor named Kristen Bortone ask me one day if I wanted to take a group fitness class and so I did. Little did I know I loved working out in groups. After I heard this amazing instructor’s story that was so inspiring I wanted to be that for others as well. I also wanted to improve my health and lose weight. Everyone at American Family Fitness was so down to earth, encouraging, and motivating. I’ve faced so many obstacles such as people saying I would never lose weight to nasty and mean comments. I never experienced this at American Family Fitness. There are people of all shapes and sizes that have encouraged to be my best self. I’ve been on this weight loss journey for 2 1/2 years exercising and trying different diets. I ran my first 5k with Kristen (my amazing instructor) by my side who’s never given up on me. I also faced three torn ligaments in my knee in 2017 and had to be out of the gym for two months. It took nine months of physical therapy and the gym to get back to normal. I have not reached my goal weight yet, but I am proud to say I’ve lost 91 lbs and have only 44 more pounds to reach my goal weight. From the instructors down to the staff, American Family Fitness Swift Creek has changed my life.